While Euonymus shrubs are very tough and drought tolerant evergreen shrubs, they can also be susceptible to certain pests if they are under stress. Do you have Euonymus shrubs in your landscape? While these are very tough and drought tolerant evergreen shrubs, they can also be susceptible to certain pests if they are under stress. A particular problem is scale, a tiny insect that infects a variety of shrubs. 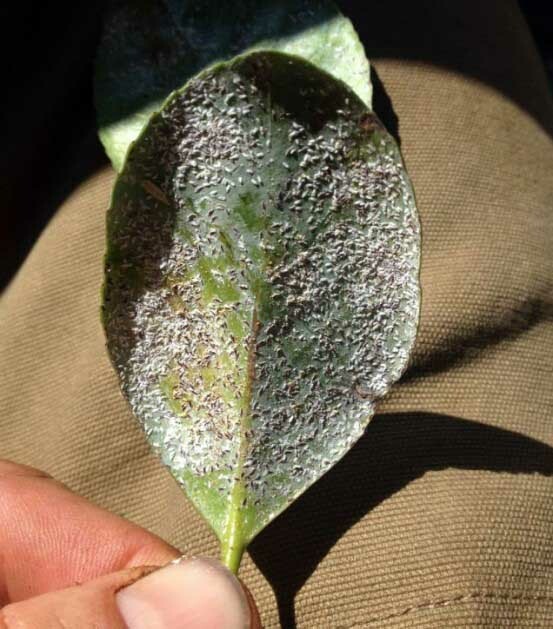 The female scale insects feed by inserting microscopic, needle-like mouth-parts into the plant and sucking out fluids. You’ll find the insects on the undersides of the leaves. This results in yellow splotches on the top of leaves. Leaves can become completely covered by infestations of scale in a short period of time. When Euonymus is planted in too much shade, or shade trees have grown over time to shade out these shrubs, they can fall victim to scale. Keeping your landscape plants healthy is a great way to keep pests at bay. Strong plants that are properly fed, watered and pruned have a better chance withstanding many types of pests and disease. Planting the right plant in the right sun exposure is also important. Plants that don’t get the sunlight they need will weaken and invite pests to move in. When you are on our year-round Soil Building program, we not only keep your entire lawn and landscape fed organically, we are also on your property each season to inspect plants and diagnose a problem before it becomes unmanageable. If you’d like to give our Soil Building program a try, give us a call at 972.272.9211 or contact us through our website.